I came across Cate Kennedy and her work in a round-a-bout way. The year was 2013, and I was about 6 months pregnant. It was also Hubbie and mine’s wedding anniversary, and on top of that I was going to a writing workshop up in the Dandenongs, hosted by none other than the above, yours truly. I had been writing my young adult novel for a while, and when I heard about the workshop, was more than intrigued. More so because it was in a location we had been to the same time last year, and it was the foundation of this picturesque setting, that I decided to take a day off work, and take myself out of my comfort zone, and to a place, both figuratively and literally speaking, where I would be alone, vulnerable and at the mercy of possible harsh elements. Not just the bush, but the critics. The day was eye-opening in many ways. I learnt much, discovered not to compromise my style, whether in life or in writing, and found that as much as some people there were truly lovely and supportive, others eyed me off judgmentally and with deep critique. It’s to be expected when there are many of the same field in the one room, and abundance isn’t the universal language of all. At the end of the day, I purchased a book from Cate, as I had never even come across her name or style. Dark Roots it said, and she wished me well in the inside cover. And finally, I started reading it over a year later, once baby girl was about 6 months old. Let me start by saying that reading darkly-themed stories isn’t probably the best idea when you have a newborn. Not to say the themes were horror and kept me up at night, when I already had a little monster doing that for me – no, not at all. Cate’s short stories embody a sense of unease about the world, about life, where people are placed in unfair situations, and in many of these they stay there. There’s a deeper meaning, a greater picture, a portrait to paint of the human condition. And it ain’t all fair and pretty. Three things became apparent to me as I made my way through the stories. The first was how bleak the stories at the beginning of the book seemed, and how mid-way through they seemed to lift just that little bit to keep me going. The second was the double-meaning of the story titles. Habit became an early favourite of mine, and very cleverly penned, both about drug use and a Nun. Resize becomes not only about resizing your wedding rings, but resizing your entire relationship. And The Light of Coincidence was another enjoyable one, talking about a favourite topic of mine, but one that showed the incredulity of life and how sometimes, things can work out in the most remarkable of ways. A game I started to play at the beginning of each story was to try and determine why the story name was as it was, only to find out it in fact had two meanings, almost every time. However my third observation and confirmation, came early on in the realisation that I was not cut out for short stories, even more so, ones that had ‘dark roots.’ I prefer to fall in love with a set of characters and a different world over a period of time, where I dedicate myself to their path, rather than the quick chop and change, 15 or so pages dedicated to each story in this book. Having said that, Kennedy is one who performs this niche art form like the artist she is, capturing your attention, your heart and your mind, making you feel for a character who may be insane, pathetic, or a murderer, and make you root for them the whole way. She has an innate ability to pull at your heart strings by showing the rawness of life, and it’s because she does this so damn well, that I just can’t fathom the sadness of it all. I had to question, how did she know this so accurately? However I had to remind myself of the funny fact I had once read, that writers become a neuro-blah expert on whatever they have set out to research, often overnight! It is just the life of a writer, to be as real as you can be about a subject matter… whether from living it, or studying it like hell. In the story Habit, I found myself rooting for the protagonist to get through customs with their drugs, even before I knew they were dying, and needed the drugs! How does she do that? And when all became even clearer at the end, without giving too much away, suddenly all the Godly mentions and phrases had a double meaning that shone with heavenly clarity 🙂 I absolutely loved it, and it was probably the first ‘kinda’ happy ending that hit me, right there. But many times, there was no ending. The story was just a window into another person’s world, their often difficult, uncertain life. There was the woman in Soundtrack, who suddenly had a child many years after having her first daughter, and how the ambulance couldn’t get there in time, so her teenage daughter helped deliver her child. And then life kept on going, to the soundtrack of life in the background. Then there was the story The Correct Names of Things, where Ellen worked in a Chinese shop in the 80s paying her way through uni. Another piece on how life is lived, and how you learn and attach names to things, where I had absolutely no idea where the story was going – it seemed, nowhere in particular, since it appeared to be more an explorative piece. In Kill or Cure, the description of farm life was so meticulous, that I recalled Kennedy mentioning her own life on the farm many times, and suddenly it all made sense. The story of a woman moving to a farm with her farm husband, trying to adjust to the land, the life, and be accepted by him, the town, and his best friend, the dog… it was all so melancholy and lonely, I also had to wonder again, how much of it was fiction. Even without a proper ending here, you couldn’t not feel. But for many of these stories, it didn’t appear to matter whether they had a purpose or ‘real’ ending, or not. They served their purpose by just providing a snapshot into another’s life, and I realised without my usual necessary closure need, that I kind of enjoyed it. The journey, and not the destination. It was common to feel achy, sad and despondent when going through the book, like in the short story Angel, where the assault of a young child is hinted at and made definite by the direct retribution that happens after, and also Cold Snap, where a young boy is ridiculed and made to feel inferior. Here the boy is laughed at, with others saying in his earshot “it looks like the light’s on but there’s no one home,” so when those same few get what they deserve, you smile menacingly, while still feeling a pang of longing for a boy who doesn’t exist, and yet somehow, you know somewhere, he does. Kennedy’s pace is fast, as suddenly you are here, then you are there, but it all happens in such continuous fluid motion that you didn’t even know you moved until you realised the sun was on your face as opposed to the bed you were just sleeping in. I felt like I could learn a thing or two from her genius. But I guess this is the way that short stories have to be, and when they are like this, they work brilliantly. Her language is telling and cheeky too… like in the story Resizing, ‘lubricate’ is used in the context of getting a car started again, and yet it means so much more in a steamy car of a formerly fighting couple on the verge of reuniting. In The Testosterone Club, a house wife concocts some comedic revenge on her untrusting husband and his friends in the form of slowly curing pickles, which says so much about manhood and the ‘flaccid’ nature that it can fall into. Here, the routine and mediocrity of a boring housewife existence was captured well, recorded as so monotonous and regular, and yet so unexpected in its satisfying final outcome. “Let me tell you a story, a connoisseur story of coincidence. There I was trundling down the ‘down’ escalator at Flinders Street Station, jammed into crowds of people, when who should I see but an old girlfriend I hadn’t seen in ten years going up the escalator across the way. She was in blue. Oblivious to my calling and waving, she disappeared up the moving stairwell. I was seized with an overwhelming urge to say hello, and at the bottom I turned and raced back up her escalator and was deposited in the whirlpool of commuters on the ground floor. No sign of her. I raced outside and saw her blue jumper, sixty or so metres up Swanston Street, so I barrelled across the road and caught up. Tender greetings followed. ‘What a coincidence,’ I said. ‘I just looked up at the right time to see you on the escalator in the station.’ A puzzled frown crossed her face. Chills, or what? The goosebumps I got from reading that grabbed my attention, and kept it more firmly for a good while after. Because when a writer develops in you some kind of emotion, whether that be sadness, grief, or more happily, belief and Hope, that is when one tends to turn up more often, and listen. And after reading this book, I am listening. There is Hope (and coincidence) for me just yet. Kennedy’s short story title accurately portrays the content which you will find inside. Surface level will show you the every day, whereas when you go beyond this, and to the roots of the matter, you will find that in the character’s thoughts, lives, and ideas, some darkness lives. In doing this, she helps us teeter on the thread of human existence, where on one side it is sunny and well, and the other shows the motivations, fears and hopes that drive us, with the overwhelming blackness that can sometimes unify and occupy us all. I see short stories in a different light now. Much lighter than the Dark Roots they came from, and I have Kennedy to thank for that. I am now looking forward to reading her other short story collection, ‘Like a House On Fire,’ waiting for me on my bookshelf. Something about the word ‘buffet,’ just makes you drool that little bit more. Is it the thought of an endless amount of food on offer for the one price? Is it the thought that rather than agonise over the seemingly endless food choices in the menu, you can try a little bit of everything? Or are we a gluttonous breed that just wants to nom nom nom? Does anyone actually realise that our stomachs can never digest more than our eyes can absorb? 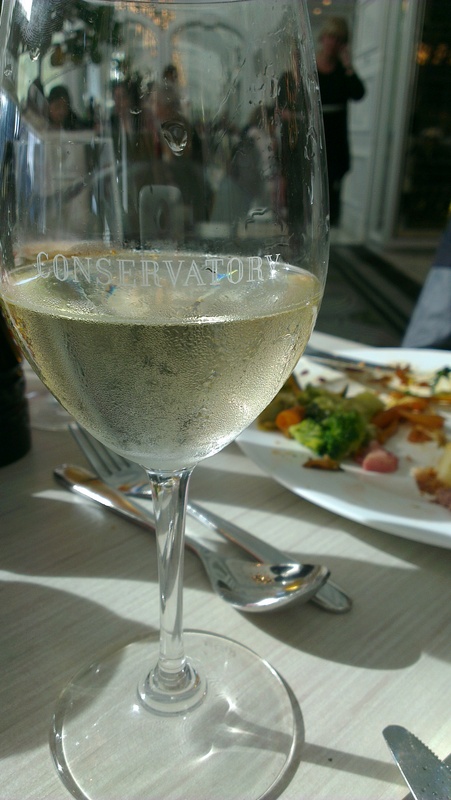 With high hopes of a banquet feast, we ventured off to The Conservatory on a Sunday for lunch, to celebrate our 6 year wedding anniversary. Awww. I had booked in advance, and upon arrival we were immediately seated at a table with high chair for baby girl ready and waiting. Superb. The room was amazing. We weren’t seated near the windows, but even so you could see the city skyscrapers and the Yarra River below. Sun room indeed. It was an amazing location. The interior had great high cathedral-like ceilings, and though everything, from the white décor to the staff presentation to the customers themselves, were of a very high and poshy standard, there was a warmth to the atmosphere too. Maybe it was the surprise of the glorious sun shining through on that Autumn day. It was a very nice feeling to know we were going to be there for the next few hours. Our lunch buffet session was to last from 12:15 – 3:00pm. I had plans to have little plates and try to taste a little bit of most of the dishes on offer there. I certainly couldn’t try a bit of everything, not only because not everything is to taste, but really? It would be a difficult job stomaching too many flavours together. As I haven’t food-blogged recently, and having the wonderful bonus of our daughter getting cranky in her high chair, I forgot to photo my first dish. So I kind of had it again for this posts’ sake. Following are the photos I took on the day, with some brief descriptions. My lovely wine, with the unmistakable white background and Hubbie’s meal. 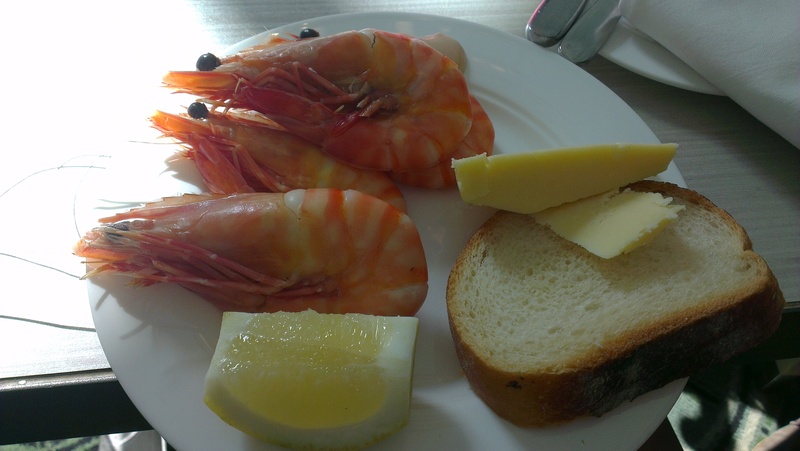 No I don’t eat prawns, cheese and bread together – the bread and cheese were for baby girl. The prawns were lovely and fresh, really enjoyable. She didn’t like the cheese, I think it was a bit of a rich, heavier cheddar, so I later brought back bocconcini which she loved. 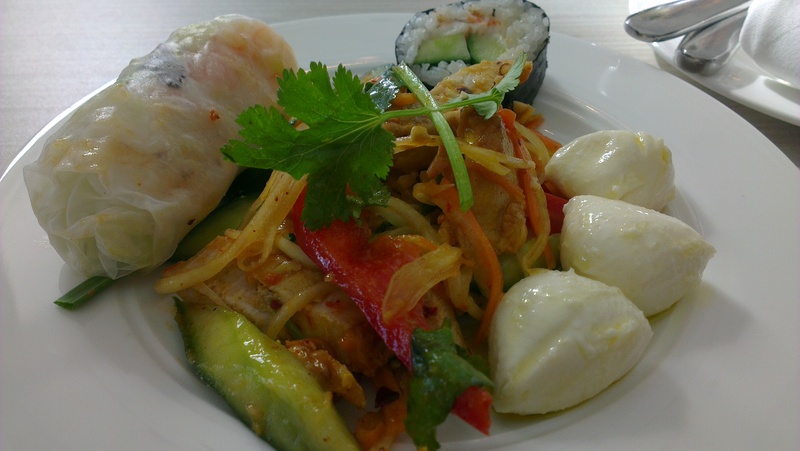 I had a kind of sweet chilli chicken salad, which had a decent kick to it – I liked that. I had a few rice paper rolls, which also had a bit of bite due to the lemongrass I think, and I chose those specific ones because I was on a prawn-fest and was craving seafood. The sushi had cucumber and prawn with some kind of paste, and also not pictured I tried a mussel which had spicy oil flavours drizzled over it. All were great. I was surprised how much I enjoyed the chicken salad though, considering there were no carbs in it. 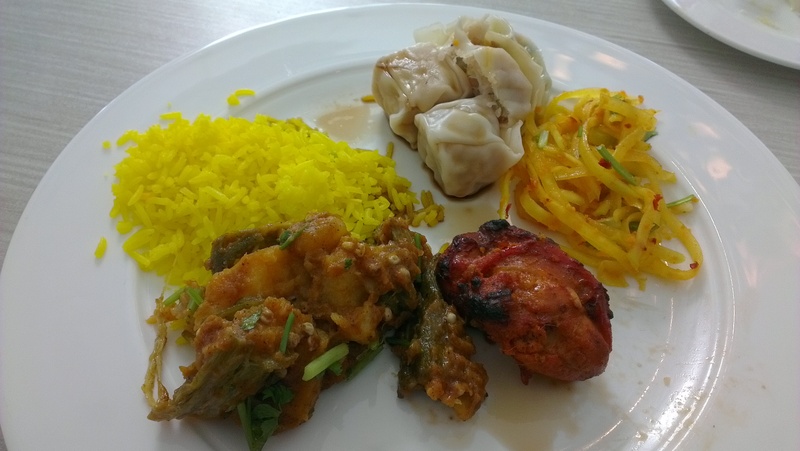 I next had food from the Indian/Asian station, which comprised of vegetable and pork dumplings with soy sauce, a spicy papaya salad, tandoori chicken, a mild potato curry, and I think what was saffron rice. I loved the vegetable dumplings – I should have gotten more of those. The papaya salad surprised me too with its spices, whereas the chicken, potato curry and rice were warm and comforting. By this stage I had had 4 plates. Some were small, some comprised of light seafood, but still four plates equalled a bit of consumption. I took that opportunity to give myself a needed food break and try to find a change room for baby girl. *Parents, take note. * By all means, take your nappy-wearing children out with you, everywhere, anywhere you dine, much like we do… just be advised that if eating at the Conservatory, you will have to jump on a golf buggy to find the nearest suitable toilets. I went through two levels before I found a very kind Crown employee who discovered there was a baby change table in the disabled toilets of The Waiting Room, one ground below Conservatory. Take note parents! It was probably a good half hour by the time I came back to the table, to see Hubbie brimming with happiness over his half-eaten smorgasbord of a dessert plate, telling me he’d just ordered a latte. So I had to catch up. Above dessert plate: A raspberry tart, brownie, goats cheese cheesecake, macaroons, and some fruit with chocolate-dipped strawberries in the middle. And I seriously thought I was going to go back for more! I couldn’t. The dessert station was a work of art in itself, my God. There were so many things I wanted to try, that I just couldn’t after I’d finished my plate… sigh. I actually enjoyed my raspberry tart the most, although everything tasted great. Baby girl had bits of dessert here and there as well as some fruit, and then of course she had her babycino which looked great. 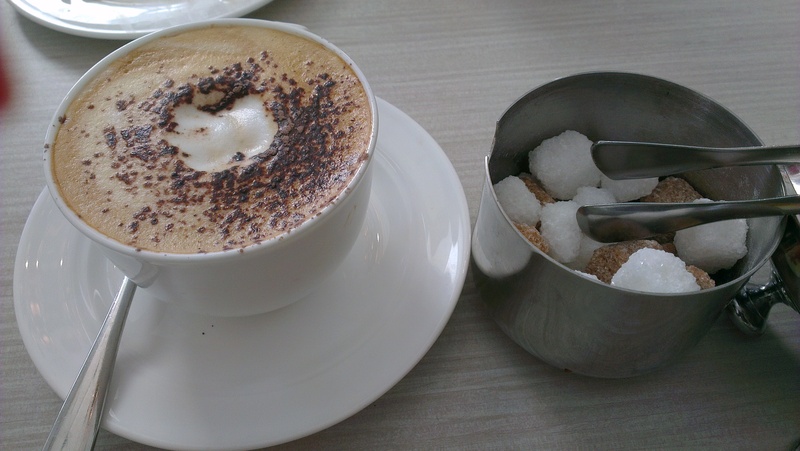 My coffee was great too, a much needed finishing-line drink after all that food. Food: 8/10. A lot of it, of a great standard, and very fresh. I almost find this difficult to rate, and explain, because usually when you eat at a restaurant you have chosen a meal that has most times been created by the chef, a meal that should be a wonderful balance and/or contradiction of flavours that dance in your mouth and that leaves you feeling satisfied, happy you ate there, and amazed at the creativity of the dish. When you dine at a buffet, YOU create the way your dish looks, YOU decide what is going to go with what and at the end of the day YOU are the responsible one for what you have eaten. Singularly, the dishes at the Conservatory were consistently great-tasting and the presentation of their food in the stations and of the stations themselves, was amazing. It’s the only food-presentation they are in control of, before we come in slap it on our plates and upload it online to show off to our friends. Coffee: 7/10. Smooth. 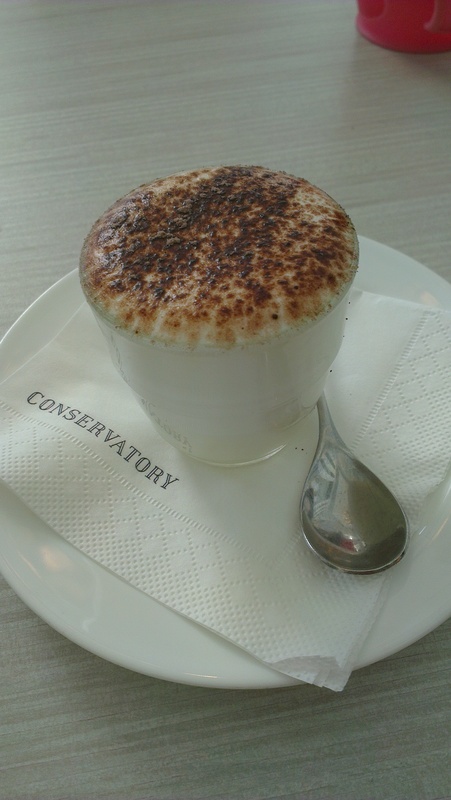 We discovered that the first round of coffees was free (part of the price you’re already paying really) when you are lunching there, with any subsequent coffee rounds at an additional price. With a coffee/foam each, we left happy about that. People: There were those celebrating milestones like us, and then there were those that are so rich they rocked up an hour into service and left earlier than everyone else because they do it once a month. Generally an older crowd, I would say 30 +. A few families though, and many large groups of people, it seems to be a social gathering meeting ground. Price: Our Sunday lunch was $95 pp. We ended up paying $212 in total with my $10 wine and Hubbie’s $12 beer. $12 for Crown?! Get your wallets ready drinkers. Children under 4 do not pay, which is great seeing as most toddlers appetites are so all over the place. (I think children 4-12 years pay 50% of the adult price). Baby girl enjoyed her bread, cheese, cheesy pita bread and bits of vegies, and of course the cake. There are things to suit the kiddies, don’t worry, especially from the dessert station – make your own ice cream cone? Hell yeah even I’ll do that! Advice: Book in advance, no matter what. I booked 6 days in advance and lucky I did, as I hadn’t realised the Logies were on that night at the Crown! Booking wasn’t an issue though. As for the food, I would suggest two things. 1: eat the things you like, whether they are a tired and true favourite, like in my case the fresh prawns, and the vegetable dumplings. Eat a lot of them too. 2: try different and interesting things that you have always wanted to try. I know this is in contradiction to the above point, but if you take these two things on board, you’ll leave happier. For example, I had the saffron rice, the sushi and then the macaroons for dessert – all great items which I enjoyed, but these three things I eat quite regularly, and if we’re being honest, they tasted about as good as all the other times I ate them. I was happy I tried the spicy chicken salad, because it was a different dish for me, however I wish I had also tried some of the Asian stir-fry and noodle dishes. It had been my intention, I just got too full and then it was dessert time. 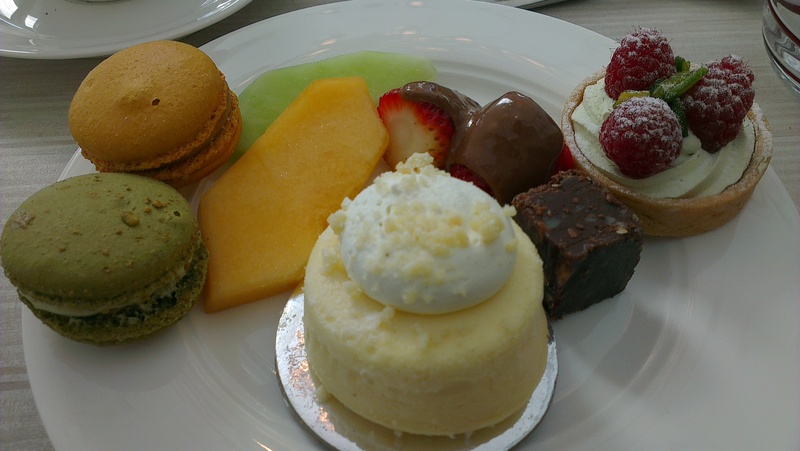 Also, rather than the macaroons, I should have tried one of the other magical looking sweet treats… you just gotta check out that food station. Food for thought. In summary of the above, eat what you like but that which you don’t get to eat often! In a nutshell: I would love to go back. They cater for dinner and breakfast as well, so you can always find a suitable time to buffet there. Taking my above two points in mind, I would go back with a vengeance. A beautiful food-lovers experience.